Interpretation: This poem is an apology to those who perished, or the relatives of those who sacrificed their lives, but ensures that it was noble of them to die for their country. It also is about how that no matter the amount of time that passes, we will never forget their sacrifices that they made for their country, and the mother country. About the Poet: Laurence Binyon established a career teaching the English arts and letters, until war broke out. He then served in the Red Cross as an orderly for the wounded soldiers and his poetic career blossomed since managing to visit the front on a few occasions. He turned his experiences on the front as an orderly into numerous books and became most well known for the poem, “For the Fallen” that sold over eight million copies. 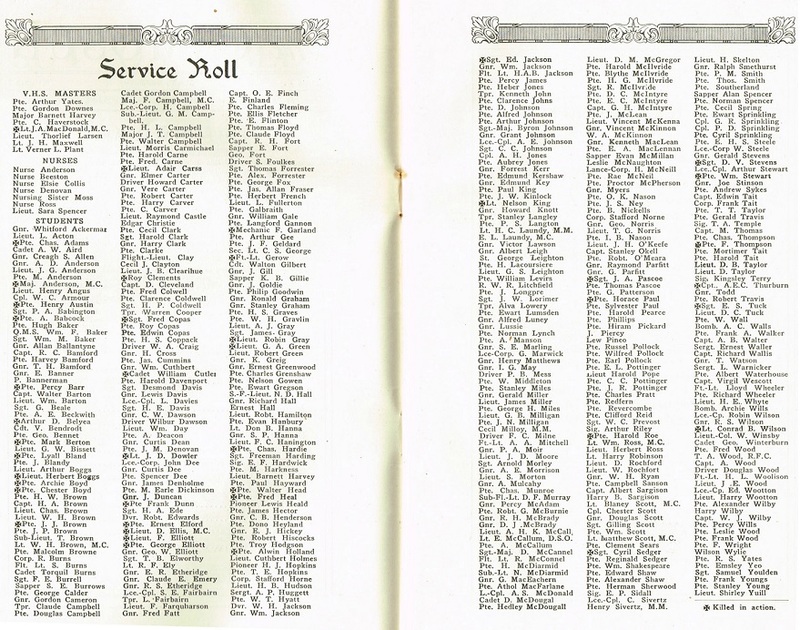 Connection to Vic High: Approximately 83 Vic High soldiers died in the war. While many returned home, only to succumb to their war time injuries. 16% of the population from Vic High who enlisted never returned and became a portion of the fallen soldiers lost by our nation.